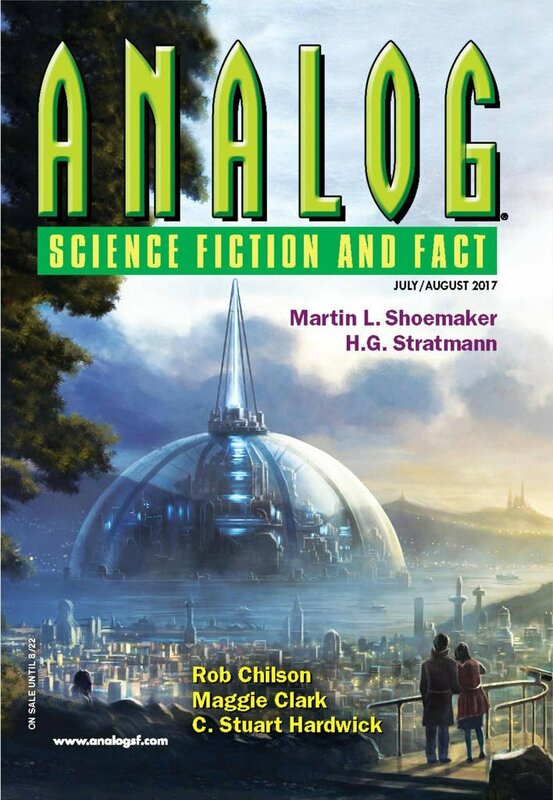 "Clarity of Signal," by Holly Schofield [bio] (edited by Trevor Quachri), appeared in Analog Science Fiction and Fact issue 07-08|17, published on June 15, 2017 by Penny Publications. Pro: She’s a good enough scientist to change her mind when the data don’t agree with her assumptions. The stigs really aren't intelligent, and that's what she'll report. Con: Too many things break suspension of disbelief. She and Landon quarrel like a new couple, not an old one. It makes no sense that she’s only allowed to study a dying stig. It’s absurd that her equipment could let here eavesdrop on the stigs given it wasn’t designed for it. The risk she takes interfering with the stigs on behalf of one that's dying implies not just considerable unprofessionalism on her part but also that she hasn't really got very much experience in the field; otherwise she'd be more inured to seeing things die. There appears to be a great deal of background to this story, which makes it feel like an excerpt from a much longer work.